Stockton, NJ (April 24, 2017) — A new analysis released today by ReThink Energy NJ and Environmental Entrepreneurs (E2), a national, nonpartisan business group, shows that 79 percent of all energy generation and efficiency jobs in New Jersey are in clean energy, with 41,000 jobs in solar, wind, or energy efficiency out of 52,000 total energy-related jobs. The analysis, which shows the strength of the clean energy economy in the state, is based on a U.S. Department of Energy report released in January 2017. The fact that the vast majority of the Garden State’s energy jobs are classified as ‘clean’ — meaning they relate to renewables or energy savings — reflects a growing, nationwide clean energy and clean transportation industry of about three million jobs. “New Jersey must intensify its focus on developing clean, efficient energy infrastructure that will not only lower harmful air emissions, but also foster long-term job opportunities for our state’s residents,” said Tom Gilbert, campaign director, ReThink Energy NJ and New Jersey Conservation Foundation. “While federal leaders are trumpeting fossil fuels, clean energy employees are hard at work. With significant solar resources and a burgeoning energy efficiency sector, the Garden State’s economy has a large clean energy sector that it can — and should — leverage,” said Bob Keefe, executive director, E2. Energy efficiency, widely agreed to be the most cost-effective energy management measure, currently creates 32,000 New Jersey jobs — and is a source of massive additional employment potential. These jobs range from manufacturing Energy Star® appliances and LED lights to installing efficient heating and ventilation systems. 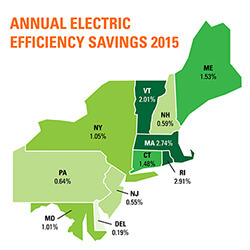 Energy efficiency programs can significantly create jobs, reduce the need for power plants, lower energy bills for residents and businesses, and improve public health by reducing harmful emissions. New Jersey’s ranking on a national energy efficiency scorecard, published by the American Council for an Energy-Efficient Economy (ACEEE) fell from No. 7 in 2006, to No. 24 in 2016. 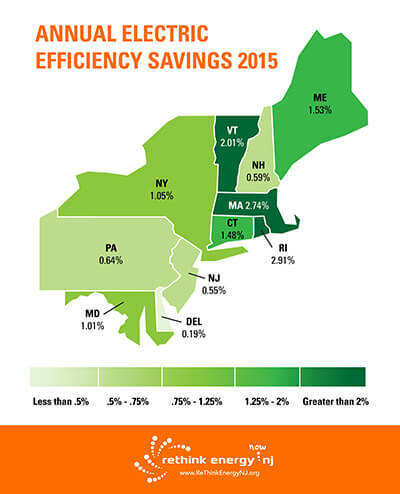 New Jersey is surrounded by states that are achieving greater energy efficiency after implementing a range of energy efficiency policies. Three times as many New Jersey residents work in solar and wind electric generation than gas and coal electric generation, with the largest number working in solar installation. Approximately 309,000 New Jersey homes are powered by solar, and in 2016, the state’s solar industry surpassed two gigawatts of installed capacity, a significant milestone. New Jersey currently has 500 onshore wind jobs, but has enormous untapped offshore wind potential, which would create substantial in-state employment. Once a leader in both solar policies and energy efficiency, New Jersey is losing ground to other states across the country, while New Jerseyans overwhelmingly support an increased clean energy focus.